my apologies for the gazillionth time, yet another review gets slow tracked, but.... so I was at Market Basket trying to find something new, but it's still a bit early in the season for that, so I decided to settle for something not on the blog. Hmmmm, slim pickins' indeed, what oh what to choose... well, I guess we're going slow churned again then! Crack open the case and color me impressed! I'm not impressed by the chocolate chips, but more by the abundance of cookie dough bits in a low fat flavor. The usual low fat approach is to cut back on the fatty inclusions, but here we see a most respectable amount of them. The great news is it looks like this through the entire container. Now I've already had this one a few times and it's got one good point and one so-so point to it. 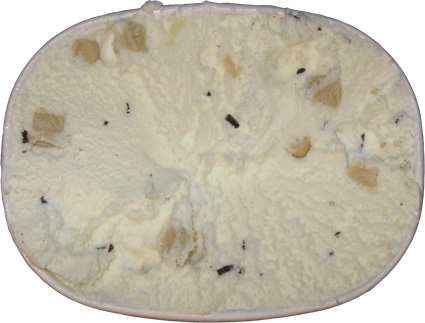 From my previous paragraph, you can guess that the decent cookie dough chunks are a real boon to this ice cream. I wouldn't say you hit them in every spoonful but Friendly's has an ace up it's sleeve. You see, this is a fairly thick ice cream. 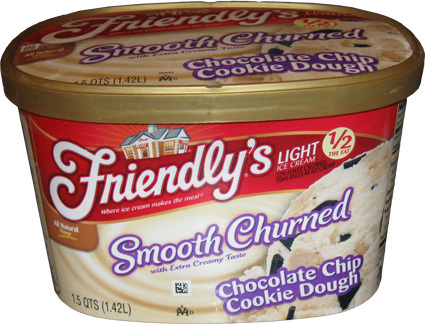 If it was Edy's, I would call it gummy, but Friendly's has used a bit of magic to keep it thick rather than gummy. This thickness tricks your brain into thinking you are getting cookie dough even when you are not. thick, so you think you are getting cookie dough even when you aren't. This is definitely the selling point on this flavor here. So what's the so-so point? Well, the base flavor is kind of boring? heheheh, that was the first word that popped into my head anyway. On second scoop, I decided "tame" might be a better choices of words. It's funny because I think in an attempt to keep it all natural, that they wind up using just a bit of real vanilla rather than a bunch of fake vanillin and so you wind up with a bit of a watered-down flavor. Actually, can I say milked-down flavor because there's a bit of an underlying straight milk flavor to this ice cream. Would I buy this again? yeah, possibly. Overall I'd say it's somewhat decent competition for Turkey Hill's Light Recipe Cookie Dough. This has bigger chocolate chips, but far fewer of them. This has a more solid (and slightly fattier) texture than TH, but the TH had a more robust and thorough flavor. Most importantly, and this is what would get me to go back to both of them, they both have plenty of cookie dough bits.